Another Monsoon Records night will be underway this week and they’ve curated yet another interesting line-up of acts. The star attraction will undoubtedly be neo-soul lady of the moment Najwa, and she will be supported by pop-punkers The D.I.A and also Min’z. Of course another star attraction when it comes to nights at the Laundry bar is that it’s a free gig, which we know is a personal favourite for all Malaysians! 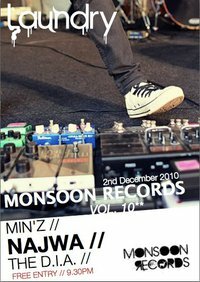 Show starts at 9.30pm on Thursday, 2nd December 2010 at the Laundry Bar, The Curve, Mutiara Damansara, Kuala Lumpur. Entry is free. Check out their Facebook page as well.